As part of her trip to England, Pamela had a chance to sit down with Oxford astrophysicist Chris Lintott and record an episode of Astronomy Cast. From the first stars to the newest planets, molecules and the chemistry that allows them to form affects all aspects of astronomy. 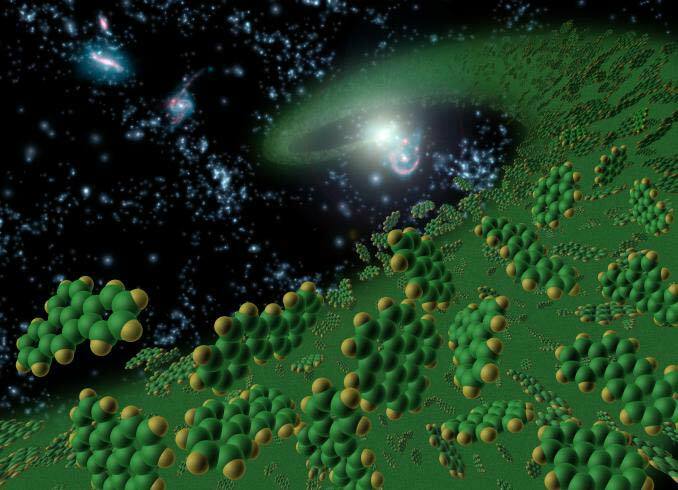 While most astronomers group molecules into three bins of hydrogen, helium and everything else, there are a few who do proper chemistry by studying the sometimes complex molecules that form between the stars. Abstract: Molecular Abundance Ratios as a Tracer of Accelerated Collapse in Regions of High-Mass Star Formation — Lintott, et al. Abstract: Molecular signature of star formation at high redshifts — Lintott, et al. Dr. Pamela Gay: With me this week is Dr. Chris Lintott of Oxford Astrophysics. Dr. Chris Lintott: Hi, how are you doing? Pamela: I’m doing well. This is a fabulous adventure this week. I’m here without Fraser and hopefully one of these days I’ll get him over here. But luckily, Chris has agreed to join in this week and talk a little bit about things that he knows a lot more about than I do. This week we’re going to talk about Molecules in Space. From the first Stars to the newest Planets, Molecules and the Chemistry that allows them to form affect all aspects of Astronomy. While most Astronomers group all Atoms into three bins of Hydrogen, Helium and everything else, there are a few who do proper Chemistry. They study the sometimes Complex Molecules that formed between the Stars. Let’s start by going back to the beginning to the first moments of the Universe where Hydrogen, Helium and trace amounts of Lithium and Beryllium were all we had. Back in those early moments, where did Molecules mix into everything? Dr. Lintott: Well at first glance it all seems rather boring. Physicists love the start of the Universe. You can solve the equations on the back of a beer mat if you know what you’re doing. Everything is simple as you say you’ve only got to worry about Hydrogen and Helium. But even here we should think about Chemistry as well. There’s only one Molecule of any importance and it’s the most common in the Universe right from the beginning to today and that is molecular Hydrogen. Page 2, two Protons stuck together. Now why do we care whether there’s molecular Hydrogen or atomic Hydrogen? It turns out that right in the beginning it’s the molecular Hydrogen that lets you form the first Stars. You see what you have within the first Proto-Galaxies are large clouds of hot gas. To form a Star you need to get that gas to collapse under its own Gravity. To do that, you’re fighting against the random motions of the particles in the gas. The hotter the gas the faster those motions the harder it is for Gravity to get anything to collapse. Once you form molecular Hydrogen though, Molecules of it are radiating. They radiate away energy. Pamela: They give up their heat. Dr. Lintott: They absolutely do that. So once you form the molecular Hydrogen, you can cause a cloud of gas to cool to a critical temperature where it can collapse to form a Star. The only problem is molecular Hydrogen is not very good at cooling things down to anything less than a few thousand degrees. So, it’s that temperature that sets the size of the first Stars. In fact we believe the first Stars must have been about a hundred times the mass of the Sun, really big behemoths that marked the beginning of the Universe. Pamela: Now Stars are quite large objects and they’re quite hot objects, why does it need any cooling at all to take place? Dr. Lintott: Well just the Gravity is quite weak. So trying to form a dense clump of material ONLY using Gravity means you better get rid of all other Forces otherwise it will be overwhelmed. So you need to cool it down to stop, to slow down these random motions to enable Gravity to win. We see that if you go into the present day where are we forming Stars? We’re forming Stars within Nebulae, within cold, dark regions of the Universe, probably with in just a few degrees of absolute zero. Not out in the sunlight lit by all the other Stars of the Galaxy. Pamela: So this is even where Pervnert, our first semester Chemistry equation comes into play. If you heat the gas up too much you have too high a velocity and everything tries to expand away against the fight of Gravity essentially. Pamela: So we get Stars forming, what are the first Molecules we want beyond H2 to start cropping up with the mixture? Dr. Lintott: We’ll ignore the minor stuff – Lithium Hydride is very exciting [Laughter] for those who study Lithium Hydride. It’s Lithium plus a Proton. With apologies to them, we’ll leave that alone. Things get really exciting once we’ve moved on to the second generation of Stars. This first generation lives fast, dies young, will explode in just a few million years seeds the Cosmax with what we call metals – Carbon, Oxygen, Nitrogen – all the interesting Elements. If you look around the Universe today the thing you see most of is a familiar molecule: Carbon-Monoxide. We see this almost everywhere that there is dense gas. It forms from collisions between Molecules. Actually it turns out to be quite useful because we can see it a long way away. We can see emission in either the millimeter – short-wave radio – or even the sub millimeter – very short-wave region of the spectrum you see out. There’s a very tight correlation between the amount of Carbon-Monoxide in a Galaxy and the rate at which that Galaxy is forming Stars. So by doing a survey of Galaxies in this otherwise obscure Molecule, we can work out the Star formation rate. We can see how many Suns are being born in each Galaxy. The remarkable thing is that this relationship holds over many orders of magnitude. So whether you’re looking at a gas cloud in our Galaxy and you want to know how many Stars are forming or whether you’re looking at a Starburst Galaxy that’s forming 50 Suns a year. Pamela: Now just to clarify is it the actual amount of the Carbon-Monoxide in the Galaxy or the strength of the Carbon-Monoxide lines in the Spectra? Dr. Lintott: Given enough hand-waving, the two are the same. [Laughter] The hand-waving is where the art of all this comes in. For example you have to worry about whether if you have a dense cloud of Carbon-Monoxide you may only see emission from the top layer. If you’re not careful you neglect the rest of the cloud. But, we’re good enough with this and we’ve studied enough local Galaxies that we can understand what’s going on. So Carbon-Monoxide is the first thing. If you have a new set of Galaxies like some of the ones we’re following up from my Galaxy Zoo project, the first thing you have to do if you want to do Chemistry is go prove to people that there is Carbon-Monoxide there. Without that you’re not getting time to do anything else. Pamela: So, once you find the Carbon-Monoxide, what other sorts of Molecules do you find next as you peer through these Star-forming regions? Dr. Lintott: What we like to do is, you see Carbon-Monoxide whenever there’s even slightly dense gas, but what we’d like to do is home in on the very dense regions where Stars might actually be forming now. Pamela: Now what do you mean to excite a Molecule? Dr. Lintott: Oh well to get to what happens to get these to emit the radio waves that we’re seeing, you just bash two Molecules together. That promotes the Electrons in the Molecule up into higher energy levels and then they drop back down and emit the radio waves. So how hard you have to bash the Molecule depends on what type of Molecule it is. Pamela: What type of densities are we talking about? Dr. Lintott: Oh well, pretty good laboratory vacuums, all right, [Laughter] a few thousand Molecules per cubic centimeter at the most, at the absolute most. But nonetheless despite these near vacuum collisions that you see in a typical early Star-forming region – a molecular cloud we call them – will have water, Ammonia, Hydrogen-Cyanide (something I’m particularly interested in), not as a chemical but as a segment of Star formation. Even things like Ethanol – a Molecule I AM very interested in [Laughter] – which may be familiar to some of your listeners. We see pints of it up in the Orion Nebula and in other nearby Star-forming regions. Pamela: Now to get those pints however, what size volume of Space are you probing? Dr. Lintott: Well that’s the thing, what you’re getting at is the – this is a near vacuum – so the idea of doing Chemistry out of a few Molecules per cubic centimeters is ridiculous. If you try and talk to a laboratory Chemist they look at you as if you’re completely insane. So we have to use the Astronomers’ magic ingredient, which is that we have all the time in the world. Well, not quite all the time in the world but a substantial fraction of time in the Universe. Pamela: Thirteen point seven plus or minus point 2 billion minus 400,000…. Dr. Lintott: That’s the age of the Universe so we’ll give you that. A typical molecular cloud lifetime is of easily of tens of millions of years. So even if collisions between Atoms say just bringing Carbon and Oxygen together to form Carbon-Monoxide. Even if the odds are extremely low that the two will ever meet, you have a few million years. You can build up some substantial amounts of all sorts of molecular species. And that’s what we see happening. Pamela: So we have all of these Molecules popping up. We’re starting to find some rather complex things including the ingredients for some other interesting cocktails. How do scientists study these Molecules? What are they useful for as we’re tracing Star formation? Dr. Lintott: There are many things. Molecules are the answer to everything [Laughter] and in a very broad sense it’s because suddenly you’ve got a huge amount of information. Say I’m looking at one Proto-Star, a Star that’s just been born. If I’m only a Physicist, if I’m lucky I’ll find out the temperature and the density and maybe the size of that Star. I could go away and build the most complicated computer model in the world to try and understand what’s going on. But I can only match against those three numbers. But I’m a Chemist as well. I care about the Chemistry. You might see 60 different types of Molecules there and suddenly my model, if it is right, I have to get all 60. So suddenly you’ve got a whole new enormously powerful way of testing your models. The other thing you can do is these are sensitive to time. Let me tell you a story about how you get the more complicated Molecules. I’ve already said that around Star-forming regions that are cold and dark and in fact it’s so cold that many of the Molecules that we see freeze out we say onto the surface of dust grains. Dr. Lintott: Think of a sand grain but about a tenth of the size. Primarily Silicon and rather light sand grains themselves or possibly some of graphite-rich carbonaceous compounds. They’re little particles of not very much formed probably from Super Novae or from the atmospheres of Stars. Dr. Lintott: Yeah, we should do a whole show on how dust forms and stuff like that [Laughter] take it for granted that you see these. If you look in the optical (we’ve all seen these images of Nebulae with a region blocked out) you see regions in the Milky Way for example. Dr. Lintott: Exactly you still need this particle onto which ice can form. In fact something interesting happens. In a catalytic converter in a car that removes all sorts of things from your exhaust, you provide a surface on which reactions can happen. The dust grains do the same thing. As the Molecules freeze on, they can react with each other. Further complicated Chemistry happens on the dust. But we can’t see anything. We only see Molecules when they’re in the gas not when they’re ice. But the center of this blob is getting denser and denser surrounded by the ice and suddenly the Star lights up. All the ice sublimates. It returns to the gas state. We get this really sudden burst of an exotic soup of chemicals called a hot core and then the Chemistry changes very rapidly because it’s not in equilibrium. You just added a whole load of new ingredients to your soup. It takes time for things to settle down. Pamela: So you’ve basically taken a bunch of frozen ingredients, allowed them to hang out in this dark molecular cloud for awhile, and then you suddenly apply heat. It’s like taking a Bunsen burner to a bunch of ices in a Chemistry lab. Dr. Lintott: Exactly, so by looking at the chemicals that still exist we can date quite precisely how old a Star is. So we can put Proto-Stars in order of age and begin to understand the process of Stellar evolution. Pamela: So what sorts of things do you see as these Stars slowly start to light up? Dr. Lintott: You see all sorts of things. You see the evolution of a complex Chemistry – actually a simpler one – things begin to break down. But you see a very specific Chemistry associated with the disk that remains around lots of these young Stars, the places where Planets are forming. The Holy Grail I think of Astro-Chemistry would be to find some really quite complicated chemicals in that disk. There are hints, there are models that predict that we should even go so far as have Amino acids the basic building blocks of Proteins in disks around young Stars. There are a couple of plane detections that they’re there with imagination [Laughter] but I’m sure that very soon we should detect complicated (it’s not life, it’s not even the building blocks of life) but its sounding a bit like Church now. 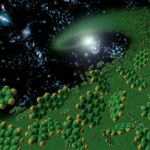 What it may be is the building blocks of the building blocks of life already in place in exactly the right place where the Solar System is forming. Pamela: We know that there are Amino acids in Space from Meteor evidence. We’re just still struggling to find it out among the Stars. Dr. Lintott: Sure but there are hints. Well, you mention Meteors so the next thing you’d like to pile on to this tower of speculation that we’re building is that having put the pieces in place in the gas and dust of the disk around a young Star, you’d love to get that material down here on Earth. Pamela: The early Sun was much hotter and it basically would have caused any liquids on the Earth to get evaporated anyway. Dr. Lintott: Either by the early Sun, that’s one possibility of course, the Earth is a much more violent place. It’s a much hotter body so you need to get water back to the Earth. The suggestion is that Comets brought it here. Just like some people believe Comets have brought water to the South Pole of the Moon that remains there waiting for us to discover it. Anyway the point is could Comets or Meteors have brought complicated Organic Chemistry down to Earth? It’s an open question. People are doing experiments involving firing things at high velocity to see if the Molecules will survive. But there is one hint that maybe this is what happened. Complicated Molecules tend to come in two types. They’re called kyroltypes. Think of a Molecule that’s made of the same selection of Atoms but arranged as a mirror-image. They react in very different ways. I think you can take aspirin, which we all take all the time. But if you take its mirror-image, same Atom, same chemical formula, it’s a poison. So it executes different Chemistry. The weird thing is that all of life on Earth uses only one set of Molecules. It uses what we call left-handed Molecules, not right-handed ones. Pamela: And occasionally in laboratories they fight very hard. For instance we have Sugar and we have Splenda. Splenda is just a different way of rearranging the Glucose Molecule. Dr. Lintott: If you say so. I think we’re still on Sugar over here. [Laughter] But nonetheless, we’d like to explain why life made this choice. Why it didn’t use the full diversity of Molecules available to it. One solution lies back in the Stars. You see there’s a particular kind of light that comes when you scatter light off dust grains. You end up polarizing light but specifically circularly polarization. It doesn’t really matter what this is. Think of it as light with special powers if it pleases you [Laughter] the point is this type of light is prevalent. There is lots of scattering of dust around young Stars. We see high percentages of this circularly polarized light. That selectively destroys left or right-handed Molecules. So you might have your building blocks of light in place, the light from the young Sun may have destroyed all of them that are right-handed and then seed Earth ONLY with left-handed Organic Molecules. Pamela: Now I’m going to have to make you explain this one a little bit better. Give us a 30-second explanation of circularly polarized light. Dr. Lintott: Is the answer “NO” acceptable? Pamela: [Laughter] no, it’s not. Dr. Lintott: You could think of light as a couple of hours, as an electric field and a magnetic field and they are at right angles to each other. Normally they are oriented in random directions, always at right angles to the direction the light is traveling in. You can force them if you pass them through polarizing sunglasses for example. You can only let through the light where the electric field lines up in one particular way. That’s linear polarization. That’s why you use sunglasses if you want to reduce the glare on the road because you can exclude the scattered light. Pamela: And it’s actually quite interesting if you’re looking at asphalt, take your sunglasses off and look through just one lens and rotate the glasses and you’ll see the color of the asphalt change as you’re blocking different directions of polarization. Dr. Lintott: Sure, we call it tarmac but yes, it’s the same thing. So you can play another trick in a slightly more complicated way. If you scatter off dust in the right way you can select only light where the electric field is rotating clockwise or anti-clockwise. If you only have clockwise light, If you only have of these types, that’s circular polarization. Confused everyone? I told you just to think of it as light with magic powers. But it gets this way by scattering of dust. We know there’s lots of dust around young Stars. We know that the Molecules are there. It’s very tempting to put the problem of why life picked only half of the available Molecules back in Space. Pamela: This leads us to perhaps go so far as to think perhaps there are other Solar Systems that have the opposite-handedness. Dr. Lintott: Yes it’s certainly a possibility depending on the alignment of that magnetic field and the dust and so on. It’s an interesting thought. Pamela: And what’s interesting is the Chemistry on Earth is not the same as the Chemistry everywhere in the Universe. Just look at the Deuterium. The ratio of Deuterium that we found here on Earth isn’t the same that you find in other places. Dr. Lintott: But it’s the same Chemistry. The results are very different. The point is that everyone knows that we’ve all eaten from good cooks and terrible cooks. So, you can have the same ingredients, you can even follow the same recipe but the results are very different in different circumstances. Pamela: And it often comes down to the ratios of the ingredient. Dr. Lintott: Sure. So the point is that we have this universal idea on that. There is a kind of Hydrogen that is Heavy Hydrogen. Normal Hydrogen just has a Proton, a positive particle. Heavy Hydrogen – Deuterium we call it has a Proton and a Neutron. The ratio with the two on Earth is about ten to one. That set way back at the beginning of the Universe. It’s one of the predictions of the Big Bang Theory that we can sort out this ratio. The weird thing is that when you look at these Star-forming regions that I was talking about before we see a huge percentage of Deuterium, way above Hydrogen. We see chemicals that we don’t see on Earth. And instead of Ammonia being Nitrogen and 3 Hydrogen Atoms, we even see Nitrogen with three Deuterium Atoms in some cases. So you’re gonna work out why this has happened. The solution is back to the dust grains that we were talking about. It turns out that Molecules with Deuterium instead of Hydrogen don’t stick to the surface of dust grains as well as that Hydrogen-Hydronate. So when we’re only seeing the gas, you selectively get left with the Heavy Hydrogen, with the Deuterium that’s scattered there. It’s a nice solution to a chemical mystery and it’s good evidence that the dust grains really are playing the roll that we think they are. Pamela: Then when you melt the ices that are on the dust grains you return to ratios that are similar to what we’re used to experiencing. Dr. Lintott: Exactly. The hard part is trying to replicate this in the laboratory. There are some wonderful people doing experiments particularly involving understanding how the ices end up on the surface of the dust grains and then how the ice comes back off the dust grains as it is slowly heated. You’re gonna compromise somewhere. You can produce a laboratory vacuum that’s the same density as Space, so that’s good. You can get the temperatures about right. It’s hard work to get down to 5 Kelvin but you can do it if you need to. Pamela: How exactly do they work on down to that low? Dr. Lintott: They use liquid Helium if they have to, but that’s expensive so we go down to liquid Nitrogen temperatures. It’s reasonable you know, minus 70 degrees. Pamela: It’s like the price of milk actually. Dr. Lintott: But much more fun. What we can’t do is get time. You never get funding to run the laboratory experiment for ten million years. Pamela: It would be fun to try. Dr. Lintott: Yeah, and we’d be impatient for the results anyway. You have to compromise some way. You run something at higher temperatures so the reactions happen faster. You run at higher densities. Nonetheless I think the thing that inspired me to attack this subject was the idea that in a basement in a Chemistry lab in London in my case at University College London, there are people trying to replicate what we see in Space. This idea of laboratory Astro-Chemistry I think is fascinating. The idea we can build our own, not Stars but at least our own dust grains. Pamela: Now I can’t end on dust grains. Dust grains aren’t the most exciting thing to me as a Stellar Astronomer out there. I’m more of an observational kind of girl. As we look out to the future, as we look to try and study the Molecules that are out there in greater and greater detail, what are some of the things that we can look forward to? Dr. Lintott: There are a couple of really important technological developments that are going to change absolutely everything. The first one is that for years we have suffered the Earth’s sub millimeter. It’s an obscure region at the spectrum, the sub millimeter. Dr. Lintott: Yeah, well any water. It’s the frequency your microwave works at. Because when you microwave something you’re heating the water in your food. So we can only really do this from very high sites. Monokea is good for example in Hawaii or a few sites like that. So it’s difficult. There isn’t much other incentive to build a receiver for this unlike Optical Astronomy where everyone has a digital camera now. Very few people are carrying around their own Heterodyne Receiver with a sub millimeter [Laughter]. I wish they were but there you go. So the point is we’ve been not behind other areas of Astronomy but it’s been difficult to push the technology forward. Then suddenly we’re about to get handed the world’s largest presents. One is that we’ve always wanted better resolution. With radiant compromises you always end up with you don’t get the beautiful picture. You get a blur across because of the long wavelengths you’re using. The first really big sub millimeter interferometer telescope combines many, many different dishes. Dr. Lintott: Yeah but for the radio, exactly. We’ve just managed to link together three separate telescopes in Hawaii, the James Clark Maxwell telescope which is a Dutch-Canadian-British institution. It’s the largest dish at these wavelengths fifteen meter dish. We’ve linked it to Cal-Tech’s sub millimeter telescope just down the road. It is a 12 meter dish so more power there. Then the Smithsonian has a whole array of small dishes. We link those in and they give us the resolution. I’ve just seen the first science results from this combination of telescopes and it’s like recovering from an operation on your eyes. You suddenly see the Universe in much greater detail. Pamela: And the way this works is a telescope’s resolution is directly related to how wide the mirror of the receiver of the detector is. In the case of interferometers what matters is what the separation between them is. Together they end up basically acting as one giant dish. They don’t have the same collecting power but they have the same resolution. The fact that these telescopes are down the road from one another gives you significantly enhanced resolution. Dr. Lintott: Yeah because you keep the collecting power because we’ve got a 15 meter dish and a 12 meter dish. This is only the starter really. Because in this amazing place in the Atacoma Desert in Chile. Pamela: Where they measure rainfall in millimeters per year. Dr. Lintott: Trakandor It’s fantastic. I’m probably getting it wrong but years of lecturing I’ve just liked proclaiming it. [Laughter] Anyway, it’s this beautiful Plain surrounded by the kind of volcanoes that kids draw. You know, triangular, smoke coming out at the top and lava running down the side. That’s what this place looks like. Flamingos on the floor of the Salt Lake, the world’s only Lithium mine kind of ruins it a bit. But nonetheless I have to give you a sense of the spectacular landscape. And there is the world’s first truly International telescope. Everyone has put their eggs in one basket in building a telescope called ALMA. It’s named after the Spanish word for soul for some reason. It’s going to be an array of millimeter and sub millimeter telescopes. About 60 dishes at about 18,000 feet above sea level, up in the high Andes. It’s high enough that it’s dangerous to work up there. The lack of Oxygen gets to you. So dangerous they’ll be bringing these 12 meter dishes back down the road so they can prepare them closer to sea level before putting them back up. ALMA is going to revolutionize this subject. It comes onstream in about 3 or 4 years time. The stated goal is to detect Carbon-Monoxide back halfway in an ordinary Galaxy halfway back to the Big Bang. So we have the history of Star formation for the last 6 billion years laid out. We’ll see nearby Galaxies in an unprecedented resolution. We’ll detect Molecules we’ve never seen before. In fact some people are worried that so many Molecules will be detected that we won’t be able to distinguish the fingerprints, like laying bar codes on top of each other. And ALMA is going to be amazing and I can’t wait to get my hands on it. Pamela: Well AstronomyCast will still be around we hope and hopefully we’ll be able to interview you when the telescope comes online in the next few years. Pamela: It’s been a wonderful interview and I hope to join you again Chris. Thank you. At long last i have been able to listen to a podcast…molecules in space…from BAUT. terrific! I missed Dr Gay’s visit to London…never mind..next time. It is a great podcast Mr Cain…and am hooked now. (1) There is no chirality in Aspirin and thus there is no toxic mirror image. The hydrolyzed byproduct of aspirin is salicylic acid. This can be toxic if taken orally. (2) Splenda is not a reconfiguration of the atoms in sugar (sucrose). It is a tri-chlorinated version of sugar, so chemically different, not a mirror image, but spatially similar. (3) Lithium Hydride is not a lithium atom and a proton, it is a Lithium cation (+1) and a hydride (a proton with two electrons and a -1 charge). I do love the show and have listened from the beginning, but as a chemist, these statements make us chemists cringe.